Should We Oil Our Scalps? Ever since I was a little girl, I can remember the twice a week routine of my mother oiling my scalp and brushing through it before securing my ponytails with a scarf at bedtime. It’s a known routine for many women of color that has carried on into adulthood. We were always taught that to oil our scalps at least once a week, if not more, to keep it healthy and growing. Even when I would go to the salon, the stylist would always recommend, or have on hand, some type of “scalp oil” to massage into my scalp to maintain its health. And why wouldn’t we think that’s what our hair needed? We’ve done it for years and our hair has always been thick and healthy? Or has it? Just because something has always been done a certain way does not mean that it is the best way. Oiling, or “greasing” our scalps the traditional way we always have, is hurting you more than you know. I know you may be thinking “How can I not oil my scalp? My hair and scalp will be too dry if I don’t.” But before you go and give me that dreaded “click” away from this post, just hear me out. I’m not trying to discourage you from oiling your scalp, it’s just what you, and myself for that matter, have been using for years thinking it was what we needed, may not necessarily be the best thing for us. When it comes to our bodies, we as human beings thrive on things that are “natural.” Natural is defined as “anything that exist in or caused by nature; not made or caused by humankind.” We know that to be the case when it comes to food mostly. Processed food, refined sugars, corn syrups, etc…, we try to stay away from. Then there’s fruits, vegetables, lean meats, you know all the good stuff, that we try to make sure we eat. This is what keeps our bodies in better health. The same goes for what you put on your body as well. I’m finding out that when I use shampoos and body soaps that are sulfate free, my skin is not as dry. Sure, we use some lotions and creams that contain synthetic or man made materials, but using something as simple as cocoa butter on the body not only moisturizes it, but it also will trigger healing to occur in the skin. The same goes for what we put on our scalps. 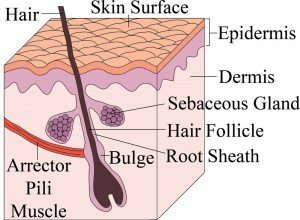 The sebaceous glands and hair follicle both reside in what is called a root sheath. The sheath is what houses the hair. The root sheath starts in the dermal layer just below the epidermis which is the first layer of the scalp. The sheath must be fed with “good things” in order to perform at its highest level. When we oil our scalps with the types of products we have always used, the sheath is not being fed properly, and often times is being suffocated by the products itself. 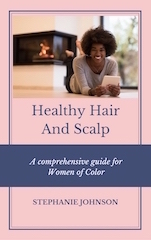 You see, most products made for women of color that is supposed to be good for your scalp contain synthetic products such as petroleum, paraffin, lanolin, dimethicone, emulsifying wax, and microcrystalline wax. The problem with all these ingredients is that they are man made. The molecules are too large to sink into human skin and essentially clogs and creates a barrier over the skin’s surface. 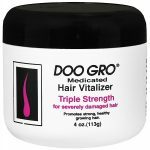 A few popular and widely used scalp products that contain these ingredients are Blue Magic, Organic Root Stimulator, Doo Gro Hair Vitalizer, and Ultra Sheen Gro Natural. I know many women, including myself, who have used these products and others with these ingredients over the years. And it doesn’t stop there. 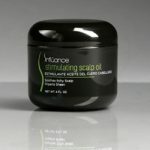 There are also medicated scalp products that we have believed to be healing our scalps that can cause more harm than good such as: Sulfur 8, Design Essentials Theraputics, Influence Stimulating Scalp Oil, and Doo Gro Triple Strength Medicated Hair Vitalizer. So what’s the answer? Yes, we should moisturize our scalps at least once a week, but use products that are helpful and will create an environment that will allow our hair to thrive. Using products with ingredients that are natural is the best way to keep your hair and scalp healthy. 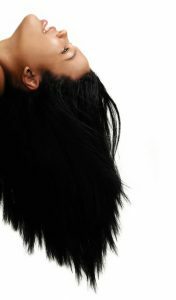 Products that have a natural base and enriched with essential oils allows your scalp to breathe and promote hair growth. I’m sure you may be wondering what exactly are essential oils? Essential oils are basically the pulp, or “life blood” of a plant. When it comes to essential oils, there are potent oils and there are carrier oils. Essential oils are very concentrated, and some, if used full strength on the skin, can be harmful. They need a carrier oil to dilute them so they can be helpful and heal the skin. There are many carrier oils that can be used to “carry” the essential oil. The most common types of carrier oils are jojoba, almond, avocado, coconut, and castor. Essential oils can also be added to butters for dilution such as shea, mango, and cocoa butter. When looking for products to oil or moisturize your scalp, make sure the product you are using is mainly made up of these ingredients. Some manufacturers like to use extracts of essential oils and pass them off as pure, but mix them with synthetic ingredients. Extract of oils typically evaporate easily and are not potent enough to trigger healing. Keep in mind that pure essential oils are more concentrated and potent the extracts. Looking for an oil or moisturizer for your hair and scalp with all these components? 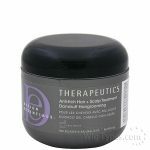 Check out The Hair Care Company’s Hair and Scalp Hydrator, and Dry Scalp Remedy. Both are full of powerful essential oils with a shea butter base that won’t weigh down your hair or leave it with a greasy feel. Always remember to stay away from products that contain petroleum, paraffin, lanolin, dimethicone, or wax of any kind to apply on your scalp. Look for products that contain pure essential oils and not extracts of essential oils. Stick to this and your hair will thrive. A healthy scalp produces healthy hair.